I can't believe Thanksgiving is a week from Thursday! I always prepare early for the holidays because everything sells out so fast. I was looking for a few more velvet pumpkins in October, but all I could find was a small amount of fall decor to make room for Christmas. Thankfully, I have plenty of fall decor and didn't have to buy anything new for my dining table. I just used what I had on hand and clipped a few flowers from my breakfast table arrangement. I have hosted Thanksgiving most years since I've been married the last 20 years. Here's a little rundown of how I prepare. 1. 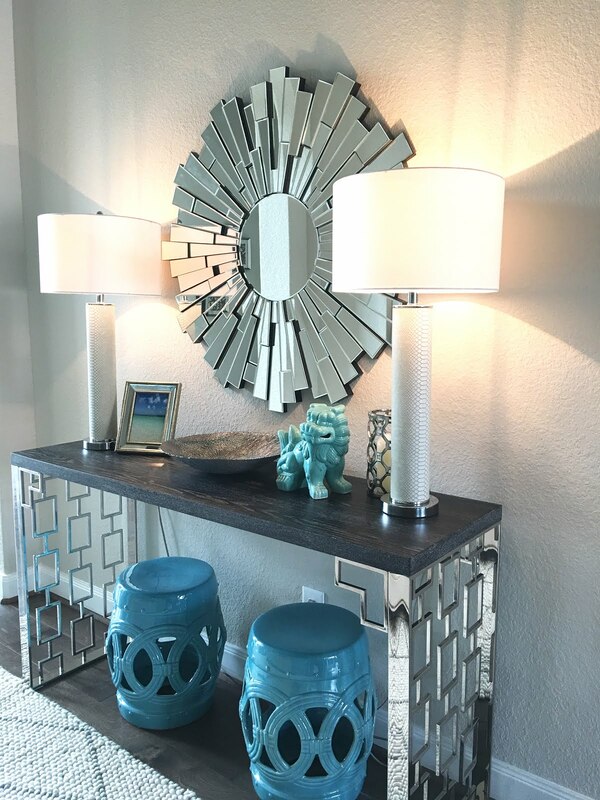 Create a Guest List-I start asking my family their plans in September. We have some out of town family and some who will celebrate with other sides of their family. I try to work around their schedules to decide if we should eat at lunch or dinner. We usually strive for lunch so we can have the leftovers that evening. 2. Take Inventory-I don't know why, but I have silverware and glassware that goes missing over the year. I make sure I have enough as soon as I finalize the guest list, which is no later than the beginning of October. My silverware is the same pattern I bought when I got married so if I want it to match I have to buy it from Amazon or Ebay. This would also be the time to check your dinnerware and serverware if you don't regularly entertain. 3. Seating Arrangements-This is probably the most difficult for me. I prefer to have everyone sit at the same table. I would be okay with a kids table if my three boys had cousins, but I don't like them in the breakfast room by themselves while the rest of the family is in the dining room. It is sometimes a bit of a logistical nightmare to get everyone at the same table. I don't assign seats, but the boys know the fabric chairs are for adults and the wood chairs are for them. 4. Set the Table-There's no point of waiting unless you are going to use the dining room before Thanksgiving. I always use a tablecloth with a rubber cloth underneath in case there are any spills (You can find them at Bed, Bath and Beyond). 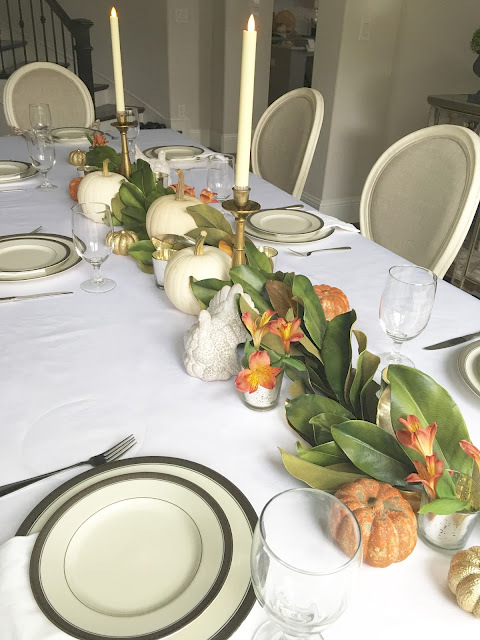 I have several different tablecloths in different lengths depending on how many leaves I use in the table. This year I have to have both leaves since there are ten of us, which means I need the 144 inch table cloth. I've learned by trial and error to keep centerpieces very low and narrow when you have a crowded table. Real flowers and greenery are beautiful, but keep in mind you will be decorating the table the night before or the day of Thanksgiving so plan accordingly. This is the reason I used a faux garland. I do have small votive holders that will hold candles and small fresh florals. I can easily find any small spray of flowers at the grocery store the day before. Fresh pumpkins are always a good idea because they last a long time. I've had mine almost two months! 5. 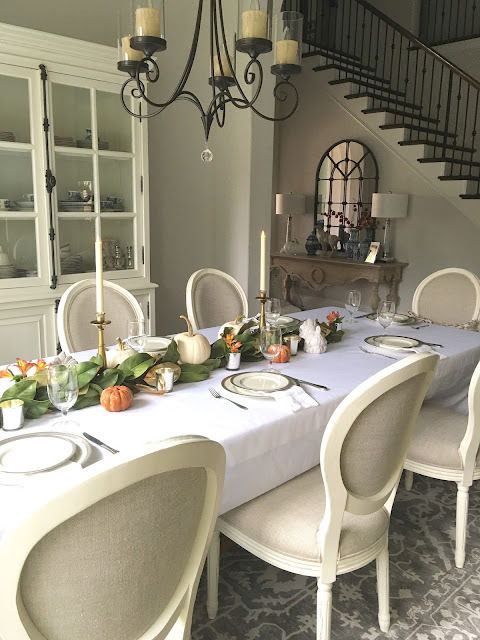 Create a Menu and Try New Recipes First-Thanksgiving is always potluck in my family. Each person is known for a certain dish so it's a no brainer who will bring what dish. My kids have asked for mashed potatoes this year so I'm trying to find the perfect recipe. The first one was a miss so it looks like we'll be having mashed potatoes for dinner again this week! 6. Shop for Groceries in Advance-I will be buying everything that won't spoil by Thanksgiving tomorrow! Don't forget about what you are making for breakfast and what you will need to enjoy the leftovers. Paper plates are always a must for leftovers so we don't have to do dishes all over again. 7. Make What You Can Ahead-Besides pies, you can also make casseroles without baking them the day before. I usually start cleaning out the fridges (we have two) before the cooking begins so there is plenty of room. You will also need those leftover containers in your fridge. If you share your leftovers be sure to have disposable containers you can give away. If you will be cooking Thanksgiving lunch consider a breakfast you can make ahead. I prefer to buy doughnuts at the grocery store for the kids so I don't have even have to think about it. I feel like many people follow a similar guideline, but everyone has their first Thanksgiving at one point! We can't all be Martha Stewart. Speaking of Martha, look at what she or one of her assistants posted on Instagram from her cooking show. Someone obviously didn't think this through. She looks like she's about to strangle this poor goose on air and cook it for dinner. 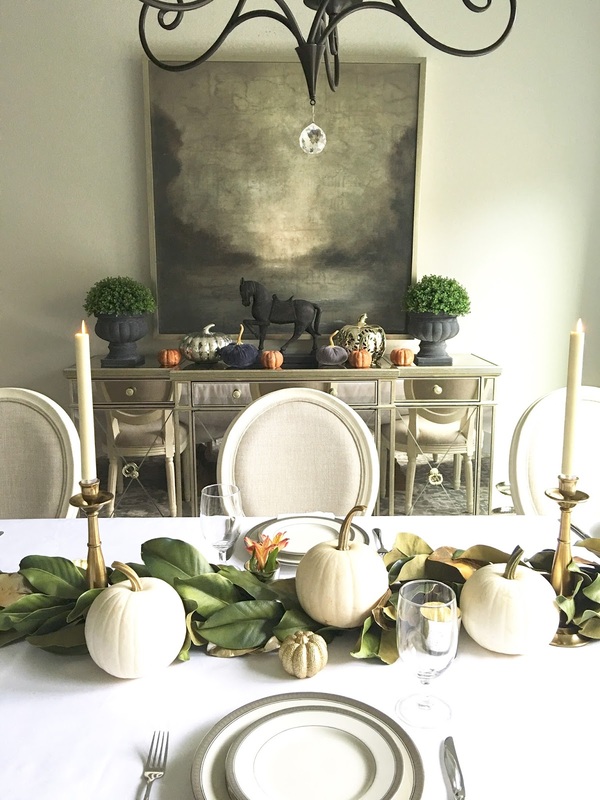 Wow, I just loved this thanksgiving table a lot. The hosting tips are just brilliant. These are definitely going to be extremely useful. 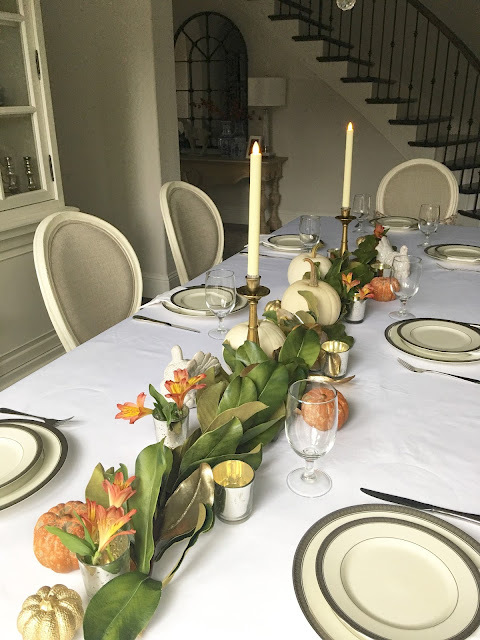 I also would be hosting a family dinner party soon at some domestic Los Angeles event venues and will surely consider these tips.